The Krug Room is an intimate, very special dining room in Hong Kong hidden beside the kitchen of the Mandarin Oriental Hotel. In this small, elegant room that seats around 12 people comfortably with views straight into the kitchen, the menu changes frequently depending on the occasion. During the last week of November 2017, talented chef Kirk Westaway from England took over the kitchen for a week. Westaway also happens to be Krug’s ambassador and so while he is in Hong Kong, he as chosen to pair 4 different Krug champagnes with his dishes. 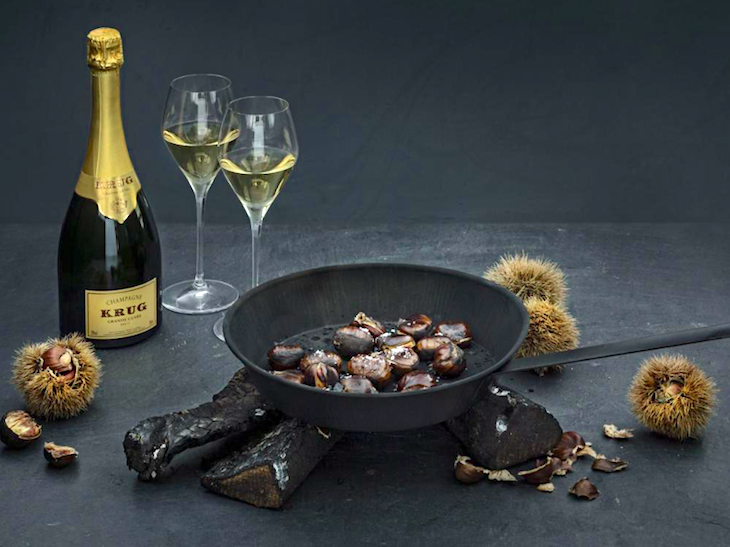 The purpose of the pairing is to show the versatility of Krug and combine it with the modern, flavorful dishes created by Westaway. What was most impressive about this pairing was the three different cuvee editions we enjoyed. For those unfamiliar with Krug’s edition, it is a way of marking the series of non vintage Krug wines that are released in the market. Since last year, Krug non vintage carries in the front label, the edition number and each subsequent wines receive a different number. This is a wonderful new concept by Krug which allows fans of the non vintage Champagne (which is blend of various vintages), to track the base wines used for different editions. For example I loved thed 164th edition which uses as the majority blend the wonderful 2008 vintage. In the next edition, 165th, the base will be the next vintage of Krug, and so on and so on. It means that each non vintage can be identified and differentiated dn followed if you particularly favor an edition. For me my favorite was the 164th edition, which I enjoyed more than the 160th older editions because of its depth, linear focus and amazing length. I enjoyed the intense, robust flavors of the Krug Rose as well as the luminous 2004 vintage Krug. However, I have to admit that my favorite was the 164th edition non vintage which is now coming to a close. If you find it available in your market, I would buy as much as you can – this non vintage is unlike any others – it will keep and age for decades, becoming more complex and richer with age. Westaway’s cooking is refined, flavorful and unique – it is hard to classify it except to call it modern European with a nod to Asian ingredients and flavors. He has worked at Daniel in NYC and Greenhouse in London and has a one-Michelin star restaurant Jaan in Singapore. I can see why he was named as the ambassador of Krug in Singapore – his food is wonderful with the intensity and minerality of Krug champagne.